Once you've bought a large cage or hutch for your guinea pigs, and preferably an outdoor run for them to scamper around in, you'll need to purchase a few accessories to make sure they have everything they need to keep them watered, well fed, and warm. You can buy these accessories from most pet shops, and there are also a number of reputable online stores which stock a wide range of items. This gives you fantastic choice, and means you can pick up high-quality items very cheaply. There are only a couple of absolutely essential guinea pig accessories, and it is important that you don't scrimp on them or you could be putting your pets' health at risk. Without doubt, the most important item you need to provide for your cavies is a good-sized water bottle. Your pets need 24 hour access to a plentiful supply of fresh, clean water, and a bottle is the best way to provide this. You can use a bowl instead, but be aware that this can become easily contaminated with loose hay, grass, and pellets, meaning you'll have to refill the water more often. 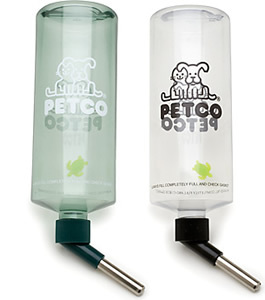 A water bottle is the easiest and most hygienic way to ensure your pets have plenty of water at all times. When choosing a bottle, make sure it has no leaks and that the spout and ball are undamaged and operate properly. If you have any trouble dispensing water, the chances are your guinea pigs will too. Generally a larger bottle is better, but these still need to be refilled with fresh water at least once a day, or more often in hot weather. Some guinea pig owners like to scatter their pets' food on the floor of their cage. While this may seem fine, it can lead to health problems if the food becomes contaminated by your pets' urine. It also makes it more difficult for your cavies to find their food, because they have to rummage around to find it when they get hungry. Heavy ceramic bowls are less likely to be tipped over by your pigs. A food bowl solves both of these problems easily and cheaply. 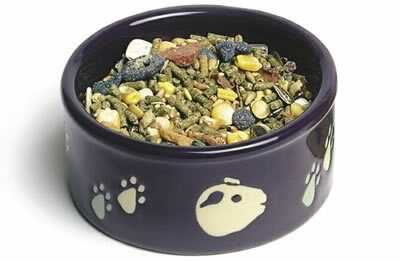 It also has the benefit of keeping your pets' food in one area, which reduces the chances of a hidden bit of food going mouldy and posing a health risk. When buying a bowl, choose a heavy ceramic one rather than a flimsy plastic one, as they are much less likely to topple over and send your guinea pigs' food flying. Finally, you need to make sure that your guinea pigs are warm and cosy at all times. Like humans, cavies are very susceptible to changes in temperature, and also feel breezes and draughts despite their hair. A generous layer of bedding and hay keeps your guinea pigs comfy and warm. Image by Tukka. Guinea pigs don't build nests like some rodents, but they do need bedding material to sleep on, so be sure to put plenty in their cage, and change it for fresh material regularly. 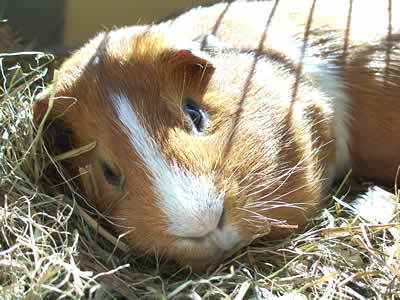 It is also a good idea to provide a selection of houses and shelters, as some cavies like to sleep in these. If your guinea pigs live outside (which isn't recommended), then it is especially important to keep them warm, particularly during the winter months. A hutch cover can provide much-needed protection if there's no way you can bring your pets indoors. As well as these must-have products, there are several optional ones that you might want to use to help keep your guinea pigs stimulated and entertained. These include items such as houses, beds, and toys. When shopping for guinea pig accessories, it can be tempting to go mad and buy dozens, cramming your cavies' cage with all manner of items. However, rather than making your pets' lives better, it can have the opposite effect, as they will feel hemmed in and unable to move. Guinea pigs absolutely love to scurry around their cage at full speed, so you need to make sure to leave ample floorspace for them to do this. If in doubt, just kit out your pets' home with the minimum recommended items, and add perhaps one or two extra ones if you have them. Save the others for when they are out of their cage, or swap them over the next time you clean them out. Not only will this give them more space to move, it also provides a bit of variety each time.